Millers' Dominic Kew takes on Greg Brown. Benington lifted the SHS Allum Fishtoft Cup in their debut season in the competition with a 3-0 final success over Premier Division rivals Wyberton Reserves. They made a bright start and took an early lead through man of the match Daniel Busch in their midweek match, before doubling their lead before the break courtesy of skipper Ben Hardstaff’s header. Friskney's Victor Navadaru battles with Heckington's Sean Mason. The game was put beyond Wyberton’s reach with 10 minutes remaining when a well-worked Benington free-kick, taken by Tom Baxter, was converted by Tim Bell. The Taylors Garages Premier Division title race still remains wide open following home wins for leaders Spilsby Town and Swineshead Institute. Spilsby’s beat Skegness Town Reserves 2-1 while Rob Masters netted the Institute’s goal in their narrow win against Pointon. Benington twice lost a three-goal advantage to be beaten 5-4 by Woodhall Spa United, an own goal and strikes from Rhys Cox, Lewis Mundt and Daniel Busch were their consolations. Mareham United were beaten 2-0 at Billinghay Athletic. Nic Stone, Guy Mantle and Jack Houghton netted as Swineshead won 3-1 at Kirton Town in midweek, Declan Sands grabbing the reply. Also in midweek, Ruskington Rovers thumped Woodhall 5-0. In the Taylors Peugeot Division One, Swineshead Reserves wrapped up the title with a 4-1 home win against Coningsby last Tuesday, Giles Favell, Richard Barker, Michael Wood and DJ Wright on target. On Saturday, Heckington Millers beat Friskney 2-0 while Coningsby - who have been docked three points for playing a suspended Mark Wheatley in their victory over Pointon Reserves - edged out Old Doningtonians 2-1, with goals from Lee Gemmell and Carl Wilson. In the Taylors Ford Division Two, Liam Shinn hit two goals for Nelson in their 4-1 home win against Coningsby Reserves, Ben Burton and Nathan Bourne also on target. Danny Cottingham got the Coningsby goal. Shane Brackenbury scored twice as Sibsey beat Westside Rangers 2-1 and Spalding Harriers beat FC Kirton 3-0. Railway Athletic were crowned Taylors Vauxhall Division Three champions following a 5-1 home win against Eastern European FC. Damian Gibbons (two), Liam Nimmo, Ryan Mason and Danny Woods hit the vital goals. Park United gained a hard-earned point against Fishtoft Reserves thanks to Chris Wright’s penalty but Jordan Lote struck for the runners-up. The Barclays Brokers Willoughby Shield final will take place tomorrow (Thursday) at Boston Town’s DW Stadium (KO 70pm). Division Two Billinghay Reserves take on third division Fishtoft Reserves. Fixtures: Thursday - BB Insure Willoughby Cup, final (KO 7pm at Boston Town): Billinghay Ath v Fishtoft Res (A. Murray). Friday - Kirton Cup, final (KO 6.15pm at Graves Park): Pointon v Sutterton (M. Bruntlett). 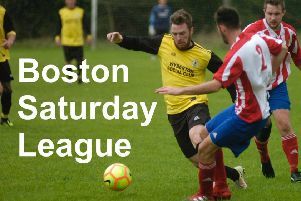 Saturday - Taylors Garages Premier Division (KO 2.30pm): Fishtoft v Old Leake (R. Holland), Kirton Town v Woodhall Spa Utd (T. Atkinson), Mareham Utd v Spilsby Town (P. Keeble), Skegness Town Res v Swineshead Inst (T. Basker); Taylors Peugeot Division One: Coningsby v Heckington Millers (S. Fisher), Friskney v Fosdyke (M. Webster); Taylors Ford Division Two: Billinghay Res v AFC Tetford (M. Thomson), Holbeach Bank v Spalding Harriers (D. Tunnicliffe), Sibsey v FC Kirton (G. Hurst); Taylors Vauxhall Division Three: Railway Ath v Park Utd (J. Hudson).